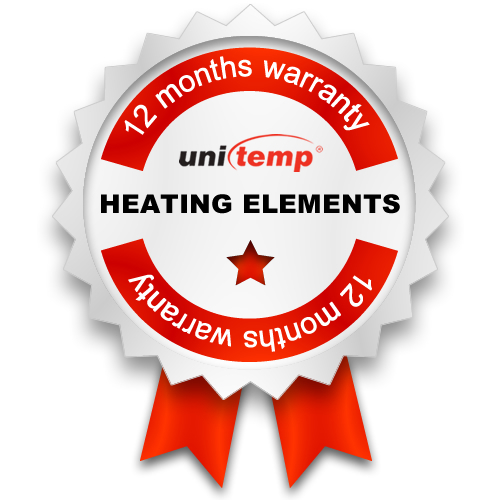 This warranty covers in-house manufactured unitemp mica and ceramic heater bands and includes any flat version of these elements. The warranty excludes brass and stainless steel nozzle elements. Our warranty extends over a 12 month period from date of purchase and covers failure due to defective material or workmanship. It is based on the condition that the product was used for the purpose and within the parameters it has been designed for and that it has been correctly installed according to the instructions provided. The warranty is only applicable to the heater as specified on its Conformance Certificate (included in delivery) and excludes damage during transport, handling or storage. The warranty extends to the product itself and is effective at our workshops. It does not cover any transport costs, labour or consequential loss or damage. Save as provided in this warranty,unitemp will not be held liable for any loss or damages of whatsoever nature, whether directly or indirectly,sustained by the purchaser arising from the use of this unitemp product. Ensure good metal-to-metal contact between the heating surface and the target area. Surfaces must be clean and free of plastic residue, spillage or foreign matter which may have coated the surface. Ensure that the surface is smooth to avoid any air gaps or inclusion of poor heat conducting substances. Elements are designed to transfer a high amount of heat-energy into a process and require the metal structure to be at least 10mm thick, otherwise the life expectancy of the element is reduced. Clamp the element firmly onto the target surface. Tighten the clamps and screws. If it is a flat element, ensue that it is secured by a suitable clamping plate so that metal contact is not lost due to warping. Re-tighten screws and clamps within 30 minutes while heating up and re-tighten once the process is on full operating temperature. Ensure that no spillage occurs. Mica and ceramic bands are not sealed and any ingress of plastic, cleaning solvents, solutions, grease, oils,moisture or any other electrically conductive substance can result n damage to the element.Only use non-electrically conductive sprays and pastes for installation. Softstart or pre-heat control techniques help to gently evaporate moisture, thus reducing failure at power-up. Temperature sensors should be placed close to the element to ensure reasonable response time to prevent overshoot in temperature and avoiding the possibility of temperature runaway on the element. Check the voltage and wattage rating and ensure that it is correct for the intended use. Connections are to be protected against the ingress of liquids/ gases to avoid short circuits. If the heating elements are supplied with connection leads without insulation or with removable insulation the customer himself has to take responsibility for connection and lead insulation. Ensure effective control of process temperature to prevent overheating of elements. We recommend the use of PID control over ON/OFF control. On cold days the temperatures can drop below the dewpoint - the result is water condensation which gathers on elements, leading to corrosion and moisture absorption. This can adversely effect the lifespan of the element and may result in failure at power-up. Softstart or pre-heat control techniques help to gently evaporate moisture, thus reducing failure at power-up. Check the process temperature requirement. Mica Elements are designed for operating temperatures up to 280°C. For applications requiring higher temperatures, ceramic heaters should be used that have a max.operating temperature of 400°C. Heater elements are manufactured from insulation materials which tend to be hygroscopic. They will absorb moisture, especially during humid periods.Store elements in a warm and dry environment. Should your stores be cold, consider installing zone heating.Ask your Unitemp specialist to advise what is best for your stores. Environment Conservation: Due to the Environment Conservation Act of 1989, “ Regulations for the Prohibition of the use , manufacture, import and export of asbestos and asbestos containing materials, 2007”, Unitemp cc has removed all asbestos containing materials from its production line to ensure that we as a company conform to the act to play a part in Environment Conservation. It must thus be noted that with the change of materials we have our high Temperature heating bands i.e. Ceramic bands giving off fumes and smoke during the initial start up phase. The element has to be returned to Unitemp with either a copy of the original invoice or a copy of the Conformance Certificate issued with the product. The heating element will be investigated at our factory and repaired/ replaced without charge should the failure be covered by the warranty as outlined above. Hazard of electric shock. Any installation involving electric elements must have its metal frame effectively grounded in accordance with national electrical code of installations and should be connected by suitably qualified electricians. Disconnect all power while installing,replacing or servicing a heater. Hazard of Fire: Since the heaters are designed to generate high temperatures, extreme care should be taken to avoid mounting heaters in an atmosphere containing combustible gases and vapors, avoid contact between heaters and combustible materials and keep combustible materials far enough away to be free of the effects of high element temperatures.